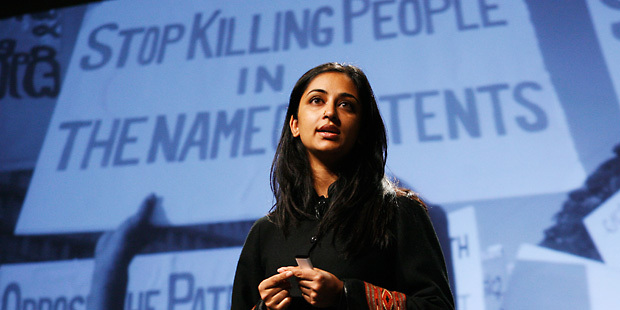 Priti Radhakrishnan gives the poor access to lifesaving drugs. With one grandfather a union organizer in the United States and the other a political journalist in India, Priti Radhakrishnan ’02 has activism in her blood. So it came as little surprise when she left a high-paying job at L.A.’s McDermott Will & Emery after just one year to take an internship, with a stipend from the Center for Human Rights and Global Justice, at the World Health Organization. Six months later she was off to Delhi to work at the Lawyers Collective, where she became an expert at patent intervention, scrutinizing and challenging patent applications. Radhakrishnan, now 31, arrived in India at a crucial time for its pharmaceutical industry. Upon joining the World Trade Organization in 1995, India was required to enact patent legislation by 2005. Patents offer pharmaceutical companies a 20-year period of exclusivity to manufacture and sell their inventions. But too often, Radhakrishnan argues, the companies make only minor changes to drugs whose patents are about to expire, then apply for patents to essentially extend their monopoly for another 20 years. “They’re gaming the system,” she said, causing profound hardship on the poor in developing nations where generics are the only affordable drugs. WHO predicts that 10 million lives could be saved yearly with more access to medicines. “That’s the injustice that drives me,” she added. In May 2006, Radhakrishnan, along with her husband, Tahir Amin, 37, an intellectual property soliciter, launched I-MAK (Initiative for Medicines, Access & Knowledge) to take on pharmaceutical companies. “We’re not anti-patent, we’re anti-undeserved patents,” said Radhakrishnan. Doing much of their work in Internet cafes and on airplanes as they fly from one developing nation to another, the two rely on a small team of scientists and lawyers to selectively review and expose unmerited patents. Arguing on the basis of scientific validity, such as newness, usefulness, and inventiveness, I-MAK has challenged patents dozens of times and has won at least two battles. In June 2008 after an I-MAK challenge, the Indian Patent Office denied Boehringer Ingelheim’s patent application on a syrup version of a pediatric anti-HIV drug that already existed in tablet form. In 2007, Glaxo- SmithKline withdrew a patent application and cut the price of an adult anti-HIV drug a year after I-MAK prepared a challenge. “Until we intervene, and impoverished patients take on the additional burden of filing legal cases, these companies don’t seem to care about access,” said Radhakrishnan. The pharmaceuticals see it differently. “Incremental improvements are not desperate moves to extend patent life,” says Ken Johnson, senior vice president of PhRMA, a membership organization that includes the leading pharmaceutical companies. He argues that, for example, creating a shelf-stable form of a drug that otherwise would require refrigeration, which is largely unavailable to the world’s poor, is a significant advance. Radhakrishnan grew up in Fremont, California. She traces her passion for science to her father, an Indian immigrant who completed his postdoctorate work in pharmaceutical science at MIT and has worked at Bay Area drug companies for the past 25 years. She recalls spending early childhood dinners listening to her dad and 1968 Nobel Laureate H. Gobind Khorana “fiercely discussing scientific theories and breakthroughs.” While her friends decorated their rooms with posters of teen heartthrobs, she had a huge laminated periodic table of elements—a gift from dad. Radhakrishnan got involved in social activism, raising awareness about domestic violence, at the University of California, Berkeley. Graduating in 1999 with a B.A. in political science and international relations, she entered NYU Law. “At orientation, the dean told us that we were a family. I don’t think I realized that this incredibly supportive community would actually end up changing my life,” she said. One course that made a deep impression was Professor Holly Maguigan’s seminar, Comparative Criminal Justice—Focus on Domestic Violence. “She was truly engaged and a wonderfully iconoclastic thinker,” said Maguigan. Once, she walked into class wearing gigantic overalls, Maguigan recalled. The slight and soft-spoken Radhakrishnan explained that how you dress affects how you sit and ultimately how you would conduct yourself in the classroom. Punishment That Doesn’t Fit the Crime? An Ingenious Way to Own the News? Across Borders, Whose Law Applies? The Importance of the Afterlife. Seriously. When Is a Pig Like a Mad Cow? Introducing Roderick M. Hills Jr. Reactions to Can Gun Control Work?